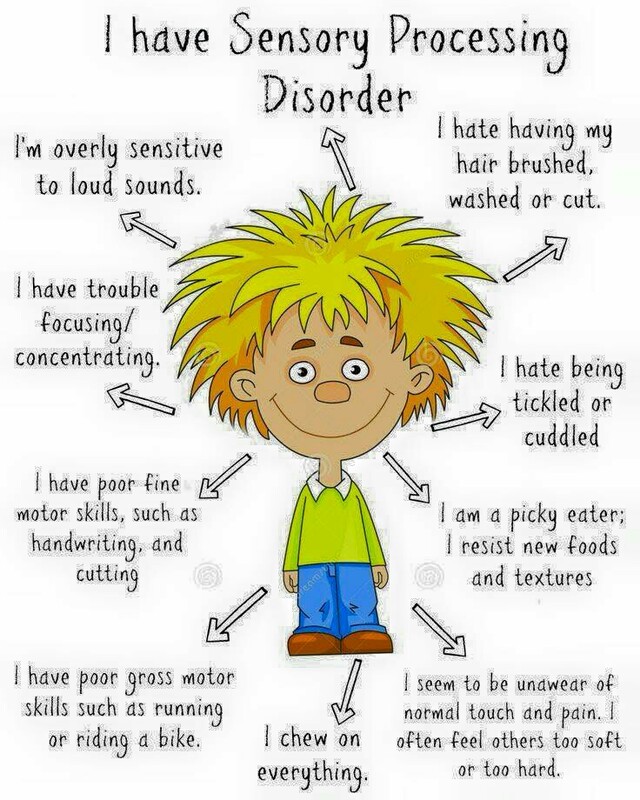 Sensory Processing Disorder, what is it? Some people are sensory defensive (avoid sensory input), sensory seekers (cannot get enough information into their bodies), and a mix of both defensive and seeking (want the input, but they desire to control the intensity, duration, and amount). We are all somewhere on the sensory spectrum. Some of us love the beach and playing in the sand and do not mind one bit that it sticks to us, gets under our fingernails while we dig, and that it gets in inconvenient places. Others of us, me included, love the beach, but we don’t like the sand, but our love of hearing the waves crash, looking out over the water, and collecting shells overrides our dislike of the sand. However, for people with Sensory Processing Disorder, or SPD, they cannot override their sensory issues, in this case they demonstrate a sensory defensiveness, to the sand. So trips to the beach often end in disaster with crying, screaming, and complete meltdowns. When a person is sensory defensive, they often act in an irrational way to a rational activity. For example, you may have a wonderful activity planned of finger painting for your child after they get home from school. You have it all set up for them, they walk in and immediately they are irrationally fearful of getting their fingers dirty, so they may try talk you out of the activity, “It’s not a good idea”, convince you to finger paint for them, try to run out of the room, become aggressive (hitting, kicking, or biting), or become silly. These behaviors are known as “flight or flight”. Think about it this way, as you are reading this, if all the sudden you smelled smoke in the room, your brain would tell you to leave, but your brain can also rationalize away fear and you remember that your spouse is making dinner, so you dismiss the smell as something on the stove burning, so your brain may be able to override the thought for a little while, but then when you see the smoke and flames, that’s it, you know you have a choice you can either “fight” the fire or you can “flee” the fire. This is how our children with sensory defensiveness often feel. For people with sensory defensiveness, it’s not always touch that may send them into “flight or fight”, sometimes it can be a sound and it may not even be a sound that a person with a well integrated sensory system would even notice. For example, the humming of fluorescent lights, the air conditioner or heating system turning on and then off, a toilet flushing down the hall at school, or even another child clicking a pen in the back of the classroom. Sensory defensiveness can also manifest itself in a fear of movement. These kids tend not to like swinging or only like to swing when they are control of how fast and how long they swing. When they were babies, they did not like being tipped backwards for diaper changes or when getting their hair washed. For people who are only sensory defensive, they often are anxiety ridden and so fearful of what is going to happen that they desire to control every aspect of their life. For a child, this may be always needing to know what comes next in their day, being extremely fearful to try new foods, new activities, new places, and even try new clothes. So in a nutshell, sensory defensiveness is being exposed to sensory information from the environment and the sensory system perceives it as new information each time it happens, which places the system on overload and that’s when we see the outcome of “flight or fight”. Another piece to the SPD puzzle is being under-responsive to sensory information. These people are the people who are always seeking some sort of input from their environment. For example in adults it can be people who love sky diving, bungee jumping, participating in extreme sports. It gives their body the input that it craves. In children this may appear as “dare devil” stunts, such as jumping off the top of a bunk bed, running and crashing onto the sofa, swinging on the swing as high and fast as possible, and dangerous, impulsive behavior. In addition, at times these children have a hard time keeping their hands to themselves, they love touching and exploring with their hands, which often gets them into trouble. They are also the children who often don’t realize how messy their face and hands are after having a messy meal or snack. So basically, these people’s sensory systems cannot give them enough feedback to let them know how much is too much or that they need to slow down and be careful. As I mentioned previously, children with SPD are often a mixture of the sensory defensive and being under responsive to sensory input, which is referred to as a sensory modulation disorder. They may avoid loud sounds, getting their hands messy, and the bright sun, but they cannot get enough of moving and crashing. Through therapy and follow through with home program activities, we are able to change a child’s ability to process sensory information appropriately. So they are able to engage in finger painting with their peers, sit and play a game, and play on the playground without seeking “dare devil” status. Next → Next post: Pediatric Kinesiotaping…What is it?